Gooseberry and Borage Flower Fool, Coriander Flowers in A Tomato Jelly Salad, and Pinks with Crème Fraiche and Fruit Salad. Do these sound familiar? Probably not. And that is the beauty of this book. 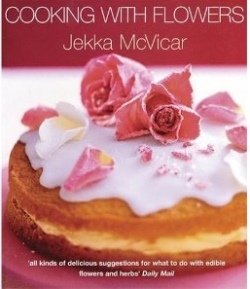 Jekka McVicar adds a European flair to Edible Flowers. Her choice of plants and her way with cooking is exciting and invites you to experiment further. From Achillea to Viola, each plant has descriptive passages on growing, harvesting and use. Recipes for each flower are included along with scrumptious photographs. 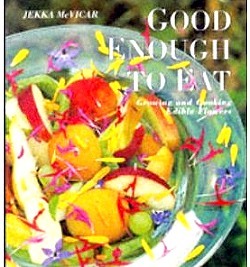 And, while there are some garden layouts and growing tips included, this book is all about the food. It will be hard to wait for the flowers. Additional books on edible flowers you might like!